Situated in the hills overlooking the old Roman town of Ponte de Lima, the golf course of the same name is operated by the Axis hotel group. The front nine, named Quinta de Anquiao, extends to almost 3,000 metres and its fairways are routed around some very hilly, wooded terrain to the north of the property. By way of contrast, the Quinta de Pais nine measures marginally longer but its holes are laid out in more conventional style within a nearby valley. Combined, the two nines form a formidable 18-hole layout that plays to a par of 71. The par five 3rd is quite a hole, double doglegging downhill to the green, and it’s a real feat to reach the putting surface in three blows, considering the hole measures more than 622 metres from the back tees. On the comparatively more sedate inward half, the uphill par five 13th – measuring a mere 489 metres in comparison – is still a tough three shot hole because it plays uphill all the way to the green. An underrated course compared to others on the Portugese list. Typifies the green Minho region: lush flora i.e. vine wrapped trees, and rabbits bouncing around the back nine are only amplified by what may be one of the signature holes, the par 5 3rd, the last 150m of which is played through a vineyard. 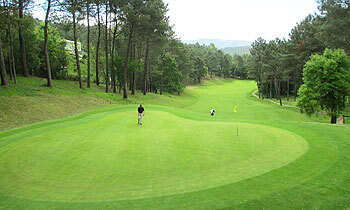 Elevation on the front nine, and meandering creek on the back nine provide variety, as do mid-fairway trees on the 7th and 12th, an isolated green across the road to the course on the 9th, and the beautiful walk from 3rd to the 4th tee through a quinta as local vintners look on. While ultimately a parkland course, there are few weak holes. A splendid game of golf on a course that couldn't be more true to one of the most beautiful and authentic regions in Europe. Well maintained and warm service in the clubhouse. Amazing course - one of the best I've ever played. Every hole was interesting and very scenic and the fairways and greens were in excellent condition. I can't wait to play this again but would recommend having a buggy. I must add the staff there were extremely helpful and friendly especially the lady in the shop! If there’s a more disparate pair of nines on a golf course then I’ve yet to play them: the front nine holes here are so up hill and down dale compared to a back nine that stretches out within a typical parkland setting - talk about a game of two halves! Apart from the wacky, severely sloped downhill 9th hole (which crosses a road then turns 90 degrees left towards a green with a small ditch surrounding it), I actually preferred the front nine as it offered a rich variety of holes; especially the rather unique short par four 4th, where tee shots are played through a very narrow corridor with trees to the right and a vineyard immediately to the left! And the long par three 8th hole - a mirror image of “Calamity” at Royal Portrush - is also one of the toughest short holes that I’ve ever played; no wonder it’s ranked stoke index 6 on the card. The back nine is a literal walk in the park after what’s gone before, with the highlight hole for me being the par four 14th, which features a railway-sleepered ditch running across the front of the green. Ponte de Lima offers quite a unique golf experience in many ways and it’s one that golfers should only play with a golf buggy – even if riding for just the hilly front nine.